Sarah Hatton of Hatton Willow is a willow weaver, willow grower and course provider. She enjoys creating baskets of the highest quality and spreading her enthusiasm and enjoyment of willow weaving to others. 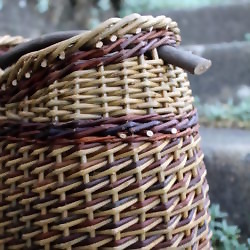 Hatton Willow is committed to making quality willow baskets using materials grown in the UK. Partner in making beautiful willow coffins at Lily Willow Coffins.